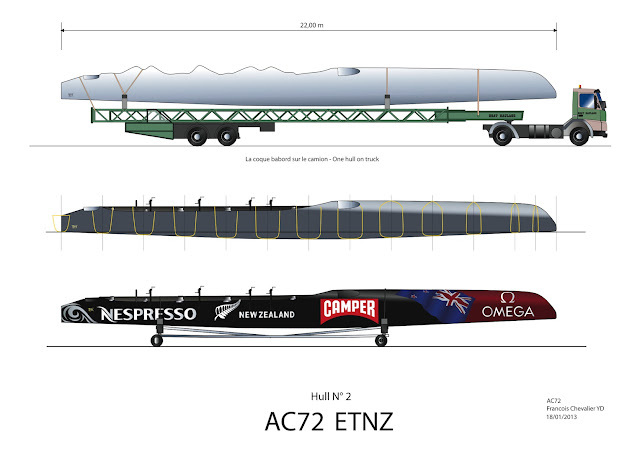 Drawing a plan of the hulls of ETNZ’s new AC72 has not been without problems. The available photos shot with a wide-angle lens are distorted. More than that, the hulls were transported inclined in their cradles, ready to be fitted to the cross-beams. However, with a little patience and careful study, it is possible to draw up a lines plan and note some changes from the hulls of ETNZ’s first boat. The new bow is thinner, with a flat-bottomed section within the first 3 meters to help elevate the bow during acceleration. The inboard side of the cockpit coaming is cut down, to the degree allowed by the Class Rule, while the outer sides are better protected. The shape of the hulls in a sense matters only a little in most situations, to the extent that the boat sails above the water much of the time, aloft on its foils. The hulls are specially designed for transitional maneuvers. When the cross beams and the new wing are seen, we will complement these drawings!